Three simple words that mean ‘nothing without labor’ in Latin and yet for Zac Leow (BSc 2014, BSc (Hons) 2015) sum up everything about his life so far. After a cycling accident in 2013 that left him paralysed, the UWA PhD candidate was told he’d be lucky to ever walk again. Yet an indomitable spirit and a willingness to challenge put in his way, saw him not only complete his Honours degree but also compete for his home country of Singapore in the ASEAN Para Games, winning silver in the 1500m and setting national records for the 400m, 800m and 1500m. Growing up Zac says he never settled for second best. Shortly after beginning his studies, the Sports Science, Exercise and Health (SSEH) student and tutor took up marathon running, using knowledge he’d gained from his classes. 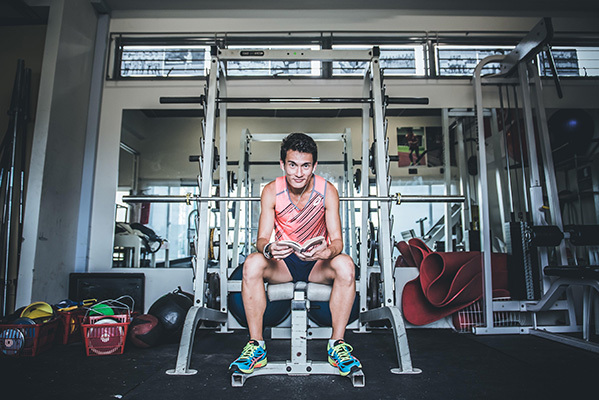 After his accident, Zac was confronted with constant pain making it tough to get out of bed and attend lectures however he never let go of his dream to run and compete again. He credits his coach and SSEH lecturer Grant Landers as well as the SSEH clinic that provided rehab between his classes with helping him make the podium last year. Hear more of his story in the podcast below.